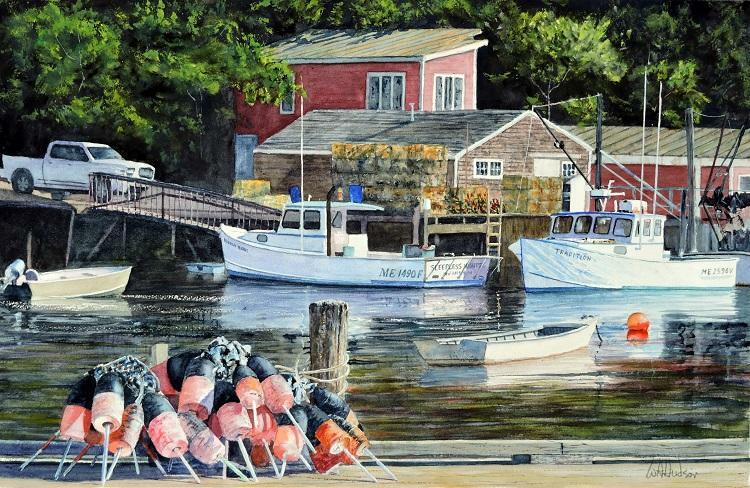 Watercolor & Casein, 15" x 22"
For me, nothing beats the coast of Maine in the summer. New Harbor is a beautiful small village with a well-protected harbor that stays busy with lobster fishermen. One Friday evening as the rest of the family settled in front of the TV, our youngest daughter Sarah began an all-nighter in our garage. She started and completed her high school extra-credit project that had been assigned an ample 5 weeks prior. It was due at 10:00 a.m. the next morning for any student wanting or, in Sarah’s case, needing additional grade points. The next morning the family couldn’t wait to see “The Boat.” We went into the garage which now smelled of fresh paint and Elmer’s glue. There was Sarah standing with a dripping paint brush in her hand, reminiscent of Jackson Pollock, smiling, and looking down at her just completed work which approximated a box kite barely covered with a single coat of red paint. In large black letters she appropriately named it “Anchor” and painted the symbol next to the name. The sides were caving in from the weight of the paint alone. 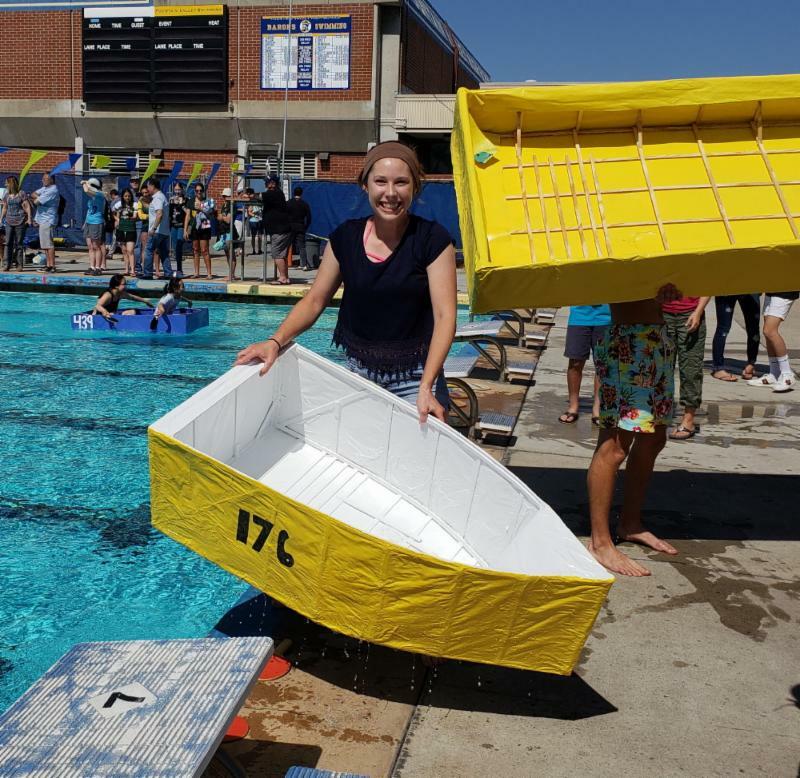 You couldn’t help but laugh thinking that in only 2 hours this would be lowered into a swimming pool and Sarah, now the epic example of optimism, actually believed she would get on board, stay afloat, and paddle 75 feet. Proud, smiling, and now talking smack with attitude, Sarah had pulled us in to her dream world where miracles were expected on schedule. We had to follow this event to its conclusion. What will the other entries be like? Could anyone possibly succeed and secure the entire ten points? The family has often discussed the next series of events which made a remarkable day of discovery and lessons learned. Lessons that were remembered and fortunately passed to the next generation. “Wow” I thought, the Hudson family is maturing and I was thrilled that Lauren asked me. Lauren first gave me a copy of the rules which are contained on a single sheet of paper. It is one of the truly great projects only undertaken by a small percent of students who either love the challenge or need the points. With triumph or defeat there are only smiling faces of committed teenagers enjoying the entire day cheering each other on. The photos below summarize the stages of Lauren’s success. I did help Lauren with a design that had to include a pointed prow, but the majority of work was on her own with a methodical approach that allowed adequate time to cut, bend, glue, and let dry the wooden structure made solely from the allotted ten, 8-foot lengths of ½ inch by ¼ inch plywood strips. Over this she cut and glued the entire 12-foot length of 36-inch wide butcher paper. With three days remaining, she applied multiple coats of the required high gloss acrylic paint. The key word here is “multiple” for the probability of success increases with each coat; paint adds both strength and waterproofing. Paint is also the only material without quantity limits. However, spray paint is strictly prohibited. 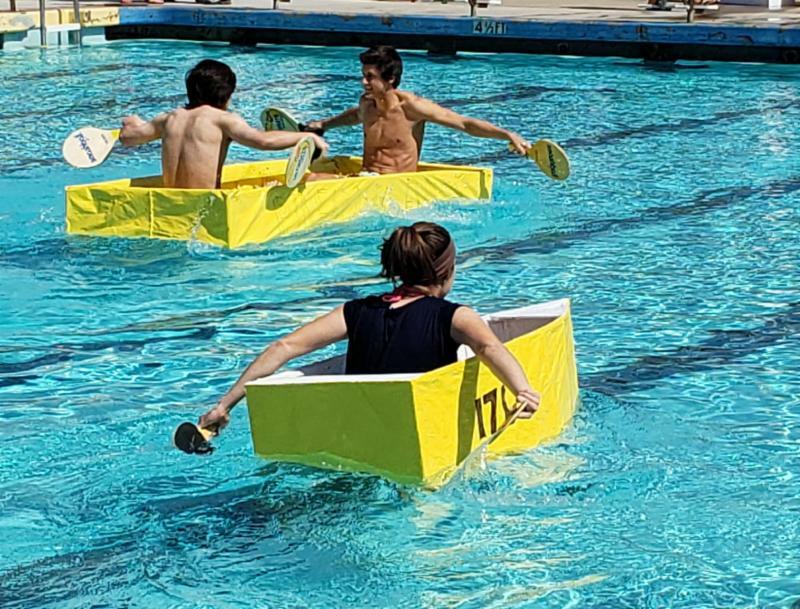 As you can see from the photos, after one week of effort Lauren easily navigated the swimming pool in her white and canary yellow boat, without a single leak, earning all possible extra points which raised her final grade from a high B to an A. For comparison, I would show similar photographs of Sarah’s boat the “Anchor.” But the boat only lived for 15 seconds after contact with water – just long enough for Sarah to drop through the rapidly dissolving bottom and score her last “2 points for the attempt.” Sarah was “shipwrecked before getting aboard” but with only one night of work she had earned 8 of the 10 possible points giving her a solid “D” in Physics. There are many lessons learned from both success and failure. Of greatest value are the lessons of failure as applied to life’s toughest challenges and ultimately achieving success. This requires tenacity. 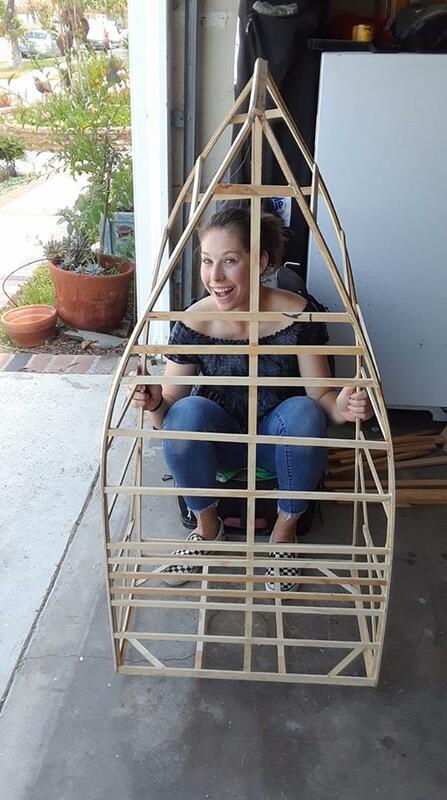 If anyone is interested in obtaining a copy of the 2018 Boat Building Rules as given to my granddaughter Lauren and perhaps starting this project at your local schools, just email me your request and I will gladly forward it to you. The boat structure had to include a "pointed prow." 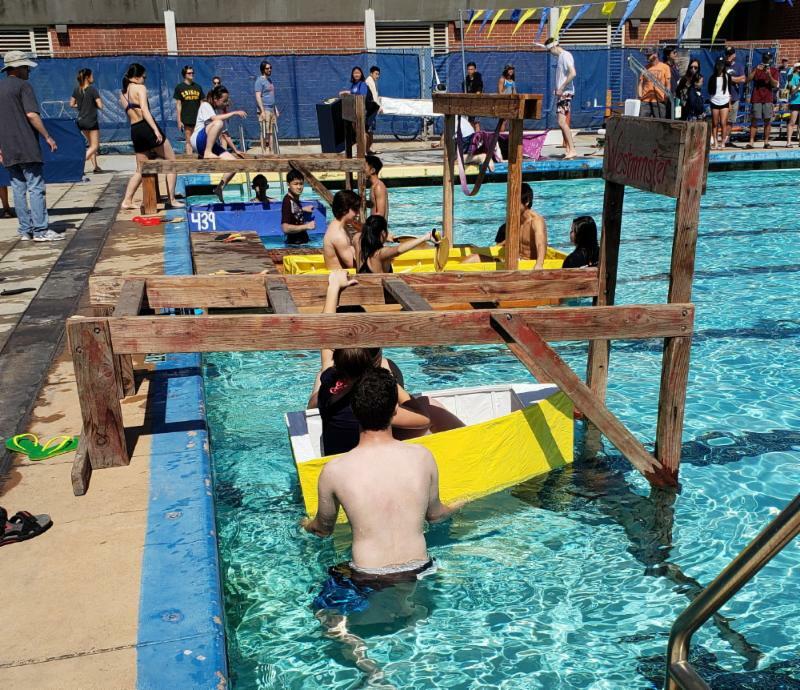 There were three launch platforms with beams that allowed the students to carefully lower themselves into their boats. One or two-person boats were allowed. The material allocation was doubled for the two-person boats. Here's Lauren at the finish. Students from three local high schools participated in the event.